This entry was posted in Questions and tagged Exclusive Psalmody, Old Testament, Theonomy. Bookmark the permalink. To discuss the question, “Why are some theonomists opposed to EP”, I wonder if it is a “first table of the law” thing. Gary North doesn’t hold to the Westminster position on the sabbath (4th Commandment). I really liked what these men had to say on the second table, but found that I didn’t agree with them on worship. This puzzled me. Those points are confusing to me as well. I don’t understand why Theonomists would deny the first table of the law. I am scratching my head over that one. 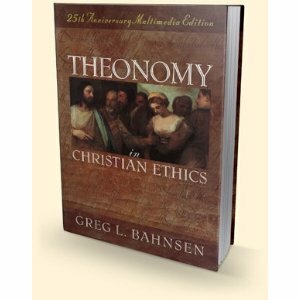 I was at first repelled by the Theonomy movement some years ago when I was trying to come to an understanding of the Christian Sabbath. I was in the process of moving toward a strict understanding of the Sabbath when I read Gary North speak out boldly against Sabbath keeping. (I came to the Sabbath at the same time I discovered the Regulative Principle of Worship) For a long time I thought the Theonomy position must not be worthy of my study since they were so obviously wrong about the Sabbath and the RPW. My position now is that Theonomists are inconsistent when they deny the Sabbath and the singing of Psalms. Of course, there are Theonomists who disagree with North on the Sabbath. Since I now embrace a view of the law that some might label as Theonomic (though I don’t particularly like to call myself a Theonomist), I hope I have the opportunity to challenge inconsistent Theonomists to turn to the Psalter in their worship. At least in my own reasoning Theonomy should go hand in hand with EP and Sabbath keeping. However, I must be totally out in left field on this question, since that has not been my experience in my interactions with those who hold to these issues. Did you listen to theonomist Kenneth Gentry on EP? No, I never had the opportunity to follow through. I apologize, but he was asking something like $16 or so for the lecture series and it seemed a little too expensive for me. I have it on good authority from a friend who recently listened to the lectures that Gentry’s objections are the common ones that have been offered against EP through the years. This has been my experience with everyone in our day who opposes EP. This subject has been debated quite extensively for the past 400 years, its not likely someone will come up with the ultimate proof against EP. But I need to listen for myself. As for Gentry, I greatly value his work. He is solid on his understanding of the law of God. As I stated above, I think a consistent use of those same hermeneutical principles that validate the law will also validate the singing of the Psalms only. Gentry is inconsistent here. Again, I have not listened specifically to his lectures, I need to do that. I would love to hear a Theonomist give good solid reasoning for rejecting EP. Thanks for bringing up Gentry. He is a good example of a Theonomist who has openly opposed EP. The irony is that currently Pastor Gentry is associated with our denomination the RPCGA. * Morecraft makes several references to R.L. Dabney, but omits Dabney’s comments on the Sabbath & Psalms. I’ll add that it can be hard to distinguish between a Theonomist with a lot of special exceptions to the continuity of the judicial laws and a non-Theonomist with a high view of general equity. I consider myself the latter. I am a hard-line Theonomist, yet I strictly uphold, observe, and defend, Exclusive Psalmody (in Public, family, and private worship), and the Sabbath (midnight Saturday to midnight Sunday). Gary North is astonishingly inconsistent regarding the Sabbath. Although a Van Tillian (which I am also) in his approach to most other doctrines and practice, he brings up matters from experience to validate some of his arguments against Sabbath keeping today, e.g. he argues that industry would be effected negatively and that would indicate it is not practical to keep the Sabbath today. He does the same regarding Leviticus 19:19, where he argues that some animal mixing has allowed for more production, and it would seem then that this law was only for Israel of old. This type of reasoning is thoroughly un-Van-Tillian, and un-Theonomic also. Rushdoony is more consistent (more Van Tillian and more Theonomic) on passages such as Leviticus 19:19 and I agree with him on this law, yet when it comes to the Sabbath he diverges also. From what I gather from Bojidar Marinov, who claims to be following Rushdoony in this respect, is that all of life is worship. Therefore from that point of view, it makes sense that the Sabbath, at least outwardly, wouldn’t differ too much from the other days. Bojidar argues that the Sabbath is not stated to be a day of worship as we would define worship; and I grant him that it is not explicitly called a day of worship. However it is clear from the Scriptures that some of the primary duties required on the Sabbath are acts of worship albeit the day is not a day of worship as such but rather a day of rest. But they blur worship with every act as a Christian, and do not distinguish it as another aspect of glorifying God. The Scriptures would teach that ALL is to be done to the glory of God, yet there are some things which are distinguished as worship, e.g. prayer, singing Psalms, reading the Scriptures, etc. Many Theonomists do not make this distinction and conclude that all is worship, and then talk about the Regulative Principle of Worship as extending to all of life. Whilst all of life must be Scripturally regulated (maybe we could call it the Regulative Principle of Glorifying God), worship is in its own category, and is regulated more specifically than our non-worshipful existence. Life in general is principally regulated by the 10 commandments, and worship is regulated by those commandments which are explicitly given to regulate acts of worship as distinguished from life in general, however even those commandments have their basis in the 10. However, Theonomy is right is seeing that the Judicial Laws are more than just “general equity.” The judicial laws are prescriptive for any commonwealth, albeit the outward form of punishments would of necessity be according to the general equity the circumstance (providence) allowed. Eg. If a tried, and convicted homosexual is to be put to death somewhere where there are no stones, then the death penalty must still prevail, but the use of stones may not be possible. But again, in saying this, a Theonomist must show that the use of stones, even back in Ancient Israel’s time, when death penalty laws were stipulated, were not the only means required, nor the fundamental goal in mind. And this is easily done, when we consider words such as: “the people of the land shall stone him with stones,” or “all the congregation shall certainly stone him,” etc. This shows that the purpose was that the people as a whole gave consent to the death of the criminal. And when we see that different forms of the death penalty were prescribed, we can begin to understand that at least in the form, general equity is permitted. But the un-Theonomic argument which allows the people’s thinking to decide whether or not a certain crime demands the death penalty or not, is altogether ludicrous and thoroughly autonomous, particularly when a crime and its punishment is given to us by precept or example in the Scriptures. Of course in matters which are not explicitly described in the Scriptures, such as say IVF etc. then we must use Scriptural principles, or the general equity of Scripture, to decide how to proceed for or against such matters. It should never be the “general equity” of people or their thinking or circumstances which decide punishments for crimes. The “general equity” of the people can only be permitted for the form of the punishment (stoning or beheading etc.) not the amount or extent of the punishment, as that seems to be the reason why wise and righteous men were required to be magistrates. So whether or not the term “general equity” in the WCF is referring to the extent of punishments or the form of punishment is what needs to be determined to see if it is correct. If it is referring to the extent of punishment, then it is wrong, however if it is referring to the forms of punishment, then it is right. It would seem from the Divines that they advocated the extent of Judicial punishments prescribed in the Law, and they clearly taught that the extent of the punishments did not expire together with the State of that people. So it would seem that they are correct regarding the “general equity,” if they applied what they taught elsewhere when they wrote the WCF. As a Scottish Free Churchman ( on the Continuing Wing) I would hold to a ‘mild’ ‘general equity’ form of theonomy. However the Free Church of Scotland is a direct descendant of the ‘Revolution Settlement’ Church of Scotland founded in 1690 along with the Toleration Act, a principle I firmly believe in. Theonomy has always struggled to make any headway in Scotland, I suspect because those circles that should have naturally embraced it, being theologically conservative original Westminster Confession Presbyterians, looked on it with suspicion, even horror! Those who potentially might have found theonomy congenial to the original ‘Establishment Principle’ of the WCF couldn’t stomach some of the idiosyncratic views or perceived arrogant tone of certain leading theonomists and baulked at the ‘worldliness’ and the attitude towards Rome and popery ( Rushdoony alarmed many when he went ‘beserk’ on being asked about this in a meeting in Edinburgh which did the credibility of theonomy no good!) some theonomists seemed to be marked by. Others, frankly, seemed bemused by it all. Finally the more ‘progressive’ elements in the Free Kirk who were more at home with statist, welfare, socialistic ideas were downright hostile. It all got caught up in the internecine feuding over a disciplinary ‘fama’ and was used by some of that party as a convenient lever to oustsome of their opponents in the fama. Thus in the very late 90s the General Assembly of the Free Church of Scotland declared theonomy not merely heterodox but a heresy. No officebearer can be a theonomist in the present day Free Church of Scotland. However the Continuing Free Church of Scotland- those ejected over the ‘fama’ – reveresed the ruling. My instinct is that theonomy today has very few activists promoting it in Scotland, even in the conservative denominations. The movement has been definitely tainted in the minds of many because of the often downright bizarre worship views that have been espoused by various theonomists. I would hazard a guess that NONE of the original leading lights were or are EP. Bahsen and Gentry always seemed the most ‘sane’ over here; indeed Bahsen did speak in both a ‘fringe’ Free Church of Scotland ( where he met with distinct antagonism) and in the Dundee Associated Presbyterian Church where the local Free Kirk minister and leading anti theonomist, Rev David Robertson, clashed with him, along with a local ‘humanist’. Sadly neither were very impressive in their arguments and Bahsen dealt with them effortlessly and with unruffled panache and politeness! The only ‘theonomists’ I have come across who are EP have been either Reformed Presbyterians or the odd, ecclesiastically isolated unattached individual. I’m a theonomist and a semi-EP 🙂 And Reformed Baptist. Its always good to hear from our Baptist brothers! Welcome!